Old Friend Footwear is the rare company that still believes in taking an old-fashioned approach to their craft, in using only the highest quality materials, and lavishing attention on detail to create beautiful footwear that lasts. Since the creation of Old Friend Footwear, our founder has constantly been active in designing and manufacturing shoes, sandals and slippers that improve the quality of life of the wearer. Old Friend will never stand for a decrease in the quality of your footwear: we began manufacturing our own massage sandals when we decided that the quality of the Maseur massage sandal no longer met our standards. Old Friend Footwear offers specially designed sheepskin slippers, ergonomic and foam shoes, and massage sandals for all foot types, including wide and extra wide. Our obsession with detail shines through in our shoes’ hand lasting, which ensures that the stitching will last. We’re the only footwear company to put arch support into our slippers, so they’re the healthiest and most comfortable on the market. Your feet have served you well in all the taxing activities you’ve put them through; isn’t it time you treated your feet right? 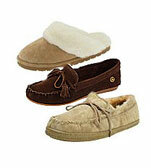 Support your arches and soothe your feet with the comfort and support of Old Friend slippers, sandals, and shoes.